Batters have been using vision drills to improve reaction time since the dawn of baseball. But new Mizzou coach Steve Bieser and his staff have embraced a new pitch-recognition technology that has translated to the hottest start in program history. Mizzou hitters are improving their ability to recognize pitches, and in turn, pitchers including Tanner Houck are getting better at the art of deception. Photo courtesy Mizzou Athletics. Hitting a baseball is widely considered one of the most difficult tasks in sports. An 86-mph fastball takes 450 milliseconds to reach the plate. This gives the batter about 250 milliseconds to decide whether and where to swing and a mere 200 milliseconds to connect. If the hitter is skilled enough to make contact — resulting in a collision that lasts one millisecond — he still must deposit the ball past nine defenders or over a wall 320 feet away. As a former professional ballplayer for 13 years, Mizzou’s new head coach Steve Bieser knows the math. But with a mostly minor-league career that includes more Altoonas and Scrantons than New Yorks, he also knows about scrapping, improvising and persevering. It’s a big reason why his eyes are open to innovative methods and nontraditional techniques that might improve his chances. The 2017 Missouri Tigers are off to their best start in history, thanks in part to the Bieser coaching staff’s groundbreaking technological approach to hitting. 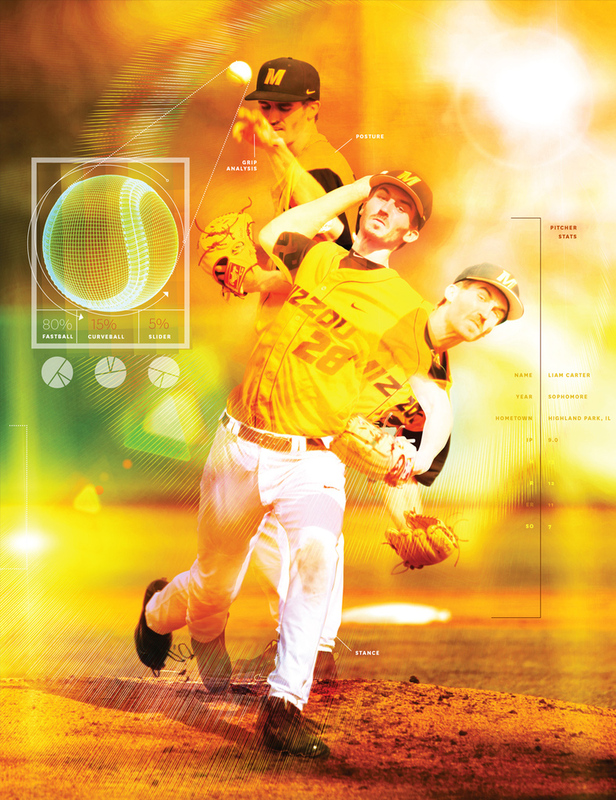 The philosophy — which blends video software and tweaked versions of standard batting drills — emphasizes pitch recognition, or quickly determining the type and location of a pitch as it leaves the pitcher’s hand. When Bieser ascended from assistant to head coach at Southeast Missouri State University (SEMO) in 2012, he inherited a roster a lot like himself as a player — plucky and determined, if not the most talented. Bieser took stock and took action. In the spirit of Moneyball, the 2003 baseball book that revolutionized data-driven player evaluation, Bieser challenged his staff to think outside the diamond and probe the sport’s trendsetting minds. If SEMO was to be a team that could routinely compete with traditional powerhouses, Bieser’s staff would need to need inventive ways to maximize player potential. Current Mizzou hitting coach Dillon Lawson pondered these perplexities in 2013 while holding the same job title at SEMO. He had long been a proponent of drills that challenged batters’ ability to see and react, using painted or numbered baseballs to improve tracking. Coaches Steve Bieser and Dillon Lawson use gameSense, a video application that improves, by fractions of a second, hitters' ability to recognize pitch type and location. Photo courtesy gameSense Sports. It wasn’t long before Lawson found Peter Fadde, a professor at Southern Illinois University and coordinator of the learning system and design graduate specialty area. 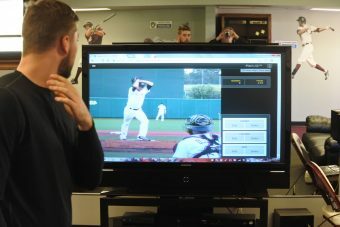 Fadde’s research focused on video occlusion, a method of showing hitters footage of a pitcher’s windup. The video cuts to black at various stages of the ball’s delivery, then the viewer guesses the type and location of the pitch. Repeated hundreds or thousands of times, the system improves the batter’s instincts in live action. Keen vision has always been the stuff of legends in baseball; Ted Williams was rumored to accurately read the labels on 78-rpm records while they spun. But Fadde’s research combined vision with prediction and reaction in a new way. Lawson and Bieser began using the videos and adding occlusion fundamentals into drills on the diamond. They started simply, asking players to blurt out pitch-types, or “yes” and “no” (swing or take), as a coach mimicked a pitcher’s delivery. They altered an old technique in which a batter chooses to hit one of two teed-up balls in different zones, employed bullpen sessions wherein hitters stood in the batter’s box guessing pitches, and gave hitters hyper-specific instructions during batting practice — always incorporating elements of pitch recognition. It worked. In one year, the training boosted SEMO’s total walks by 30 percent, team batting average by 14 percent and runs per game by 48 percent. Power numbers improved, too, as patient sluggers did more damage connecting with pitches in the strike zone. The Redhawks went from a losing record in 2013 to three consecutive years as Ohio Valley Conference champions. 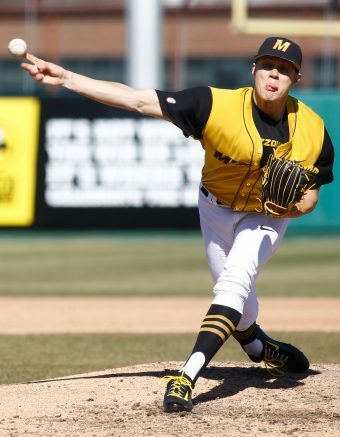 “The trick was finding ways to add pitch recognition into the players’ established practice routines,” says Lawson, whose success landed him a job in the Houston Astros system before he reunited with Bieser at Mizzou last year. “They’re already watching video; let’s change how they’re watching video." 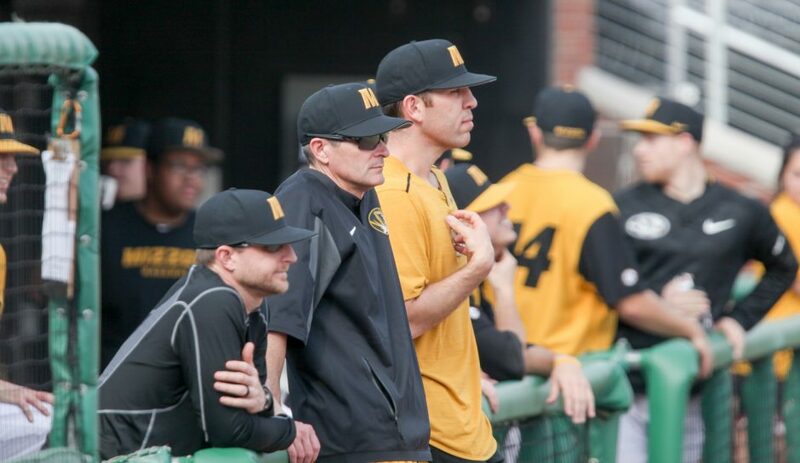 Lance Rhodes, assistant coach and recruiting coordinator; Steve Bieser, head coach; and Dillon Lawson, hitting coach; revived Mizzou baseball with a new philosophy that helps batters anticipate pitches. When Bieser arrived at Taylor Stadium in 2016, the Tigers needed an overhaul. The team had finished last in the Southeastern Conference, at or near the bottom of every offensive statistical category, and had failed to make the NCAA Tournament for the fourth consecutive season. As quick as SEMO’s pitch-recognition renaissance might seem, the 2017 Tigers’ campaign has been even more dramatic. Mizzou followed an opening day loss with a 20-game winning streak — the second-longest in program history. Through a quarter of the season, the Tigers had increased run production by 19 percent, hits by 26 percent, extra-base hits by 62 percent and home runs by 40 percent, compared to the same point in the 2016 season. Missouri also has upped its team batting average from .279 at the end of 2016 to .308 at press time — second in the SEC. The Tigers pounced on Alabama the opening weekend of conference play, sweeping the three-game series from the Crimson Tide and scoring multiple runs in the first inning of each game. It was only the third time Mizzou had swept an SEC opponent and the team’s first road sweep in two years. The pitch-recognition program might also be contributing to the Tigers’ improvement on the mound. The constant loop of feedback from hitters announcing the incoming pitch has motivated pitchers to be more deceptive. Bieser and Lawson insist the pitch-recognition strategy is evolving. It isn’t a rote program but rather part of an overarching philosophy that permeates every aspect of practices and games. As the season progresses, the coaching staff will continue to harness technology — such as the newly installed TrackMan system at Taylor Stadium, a high-tech radar device that records ball flight, spin rate, etc. — to advance cutting-edge baseball thought. In a sport rooted in traditions going back to the 1800s, novel ideas can be tough to discover — and harder to install.